About a year ago, I called a few hotels in Pennsylvania in an attempt to find a room near Gettysburg for the 150th anniversary of the epic battle of July 1-3, 1863. I couldn’t find a room within 20 miles of the battlefield, and eventually gave up. Which means that this month, thousands and thousands of visitors toured the Gettysburg field and took pictures of the sights: the flank on Little Round Top where the 20th Maine held the ground, the little spring where the Union fought a desperate holding action, the ground on MacPherson’s Ridge where General Reynolds died. Everyone who visits Gettysburg goes to the Bloody Angle, the High Water Mark of the Confederacy, where Pickett’s Charge broke through. Along the line at the Angle, near the famous Copse of Trees, is a strange monument. Unlike the thousands of other monuments at Gettysburg, this one stands out because it is just a big chunk of stone. The monument honors the men of the 20th Massachusetts Infantry Regiment that fought at Gettysburg and were part of the force that repulsed Pickett’s Charge on July 3. 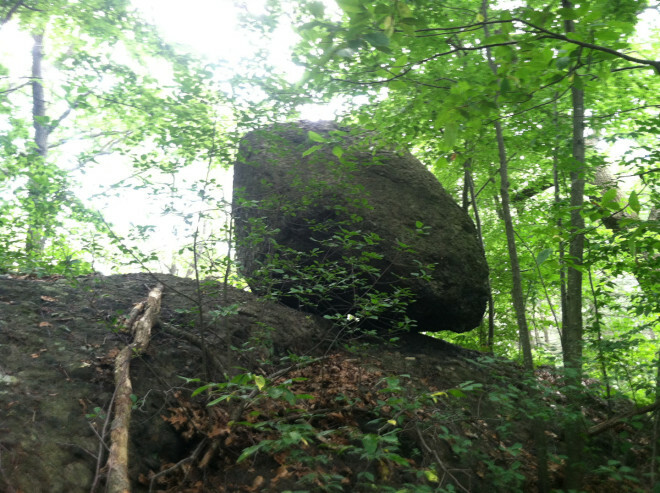 The monument is a large boulder known as a “Puddingstone,” native to Massachusetts and the official stone of the Commonwealth. It was brought for the monument’s dedication from Roxbury, where many of the men of the regiment had played on such boulders as they grew up. The monument was dedicated on October 20th, 1885. So, maybe I’m somewhat monomaniacal about things related to Franklin Park, but I couldn’t help but notice a few things in that statement. Franklin Park is in Roxbury. Construction on the Park began in 1885. 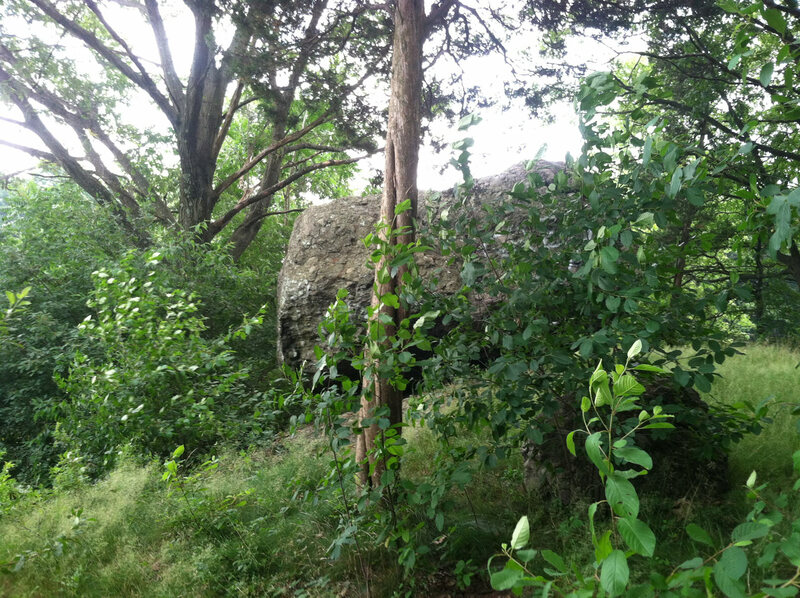 The Park is full of Puddingstone boulders, which can only be found in a very limited part of the region. Did the 20th Massachusetts Monument at Gettysburg come from Franklin Park? Via the Boston Public Library’s Flickr. Whether or not the monument came from the Park, the place is full of Puddingstone boulders. 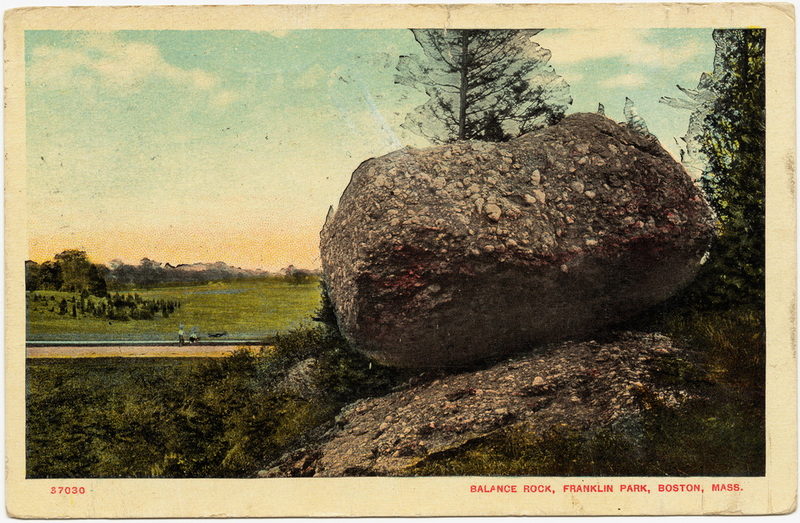 Above is a postcard view of The Balance Rock in Franklin Park. It was, apparently, an attraction for visitors because of the precariousness of the stone, and the feeling that it might fall at any moment. I first stumbled upon this rock while shooting photos of Schoolmaster Hill. The Balance Rock sits on top of rocky knoll on the opposite side of Circuit Drive from the Hill, and is completely hidden by trees. Even though I had found this postcard, I had not expected to find the rock and was surprised to see this graffiti-covered chunk. Of course, looking at the postcard above I can now see it clearly: the golf course and Circuit Drive are in the background, but you can’t see them today. 2013 view of the Balance Rock, from the same angle as the postcard. The bedrock formation extends well beyond the limits of Roxbury, underlying part or all of Quincy, Canton, Milton, Dorchester, Dedham, Jamaica Plain, Brighton, Brookline,Newton, Needham, and Dover. It is named for exposures in Roxbury, Boston area. Those of us who live in Boston know it well. Any house over 100 years old has a basement made of the stuff, and it is used liberally throughout all the city parks. Frederick Law Olmsted, who built Franklin Park, loved it and used it as his basic material for buildings, staircases and walls. Throughout Franklin Park you find outcroppings of Puddingstone, and there are many boulders of the conglomerate dispersed throughout the Park. A different Balancing Rock in the woods on Hagborne Hill. Two Puddingstone boulders on Hagborne Hill, near the picnic area. 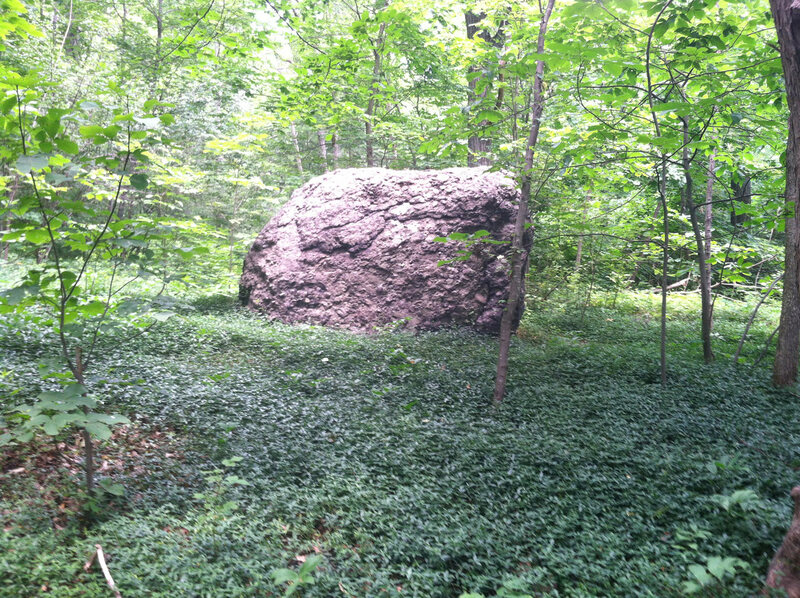 A huge Puddingstone boulder in the Wilderness, near the 99 Steps. 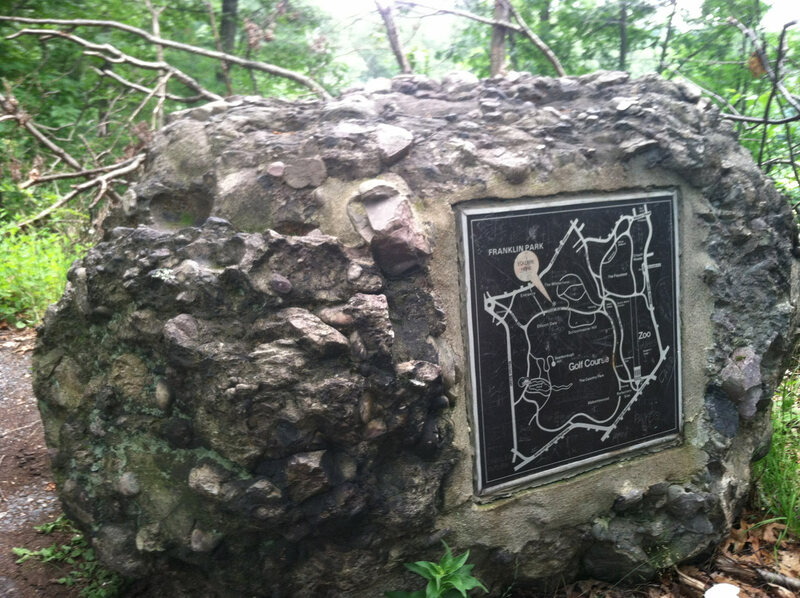 Puddingstone boulders are so common the Park uses them to frame maps. 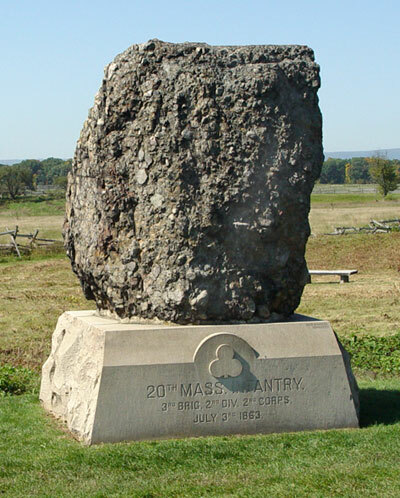 I think it is quite an amazing thing that the men of the 20th Massachusetts are honored on the Gettysburg battlefield with a chunk of Puddingstone. 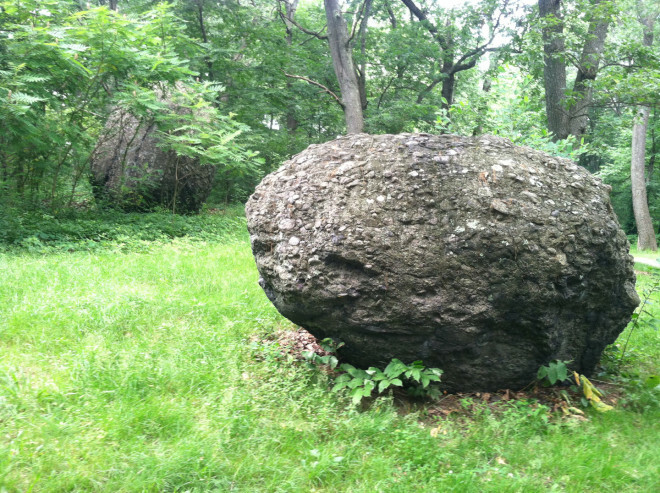 This boulder is very unique to Boston, the kind of thing you can only find here. If it came from Franklin Park, that would be even more amazing. The next time you’re in Gettysburg (or your first time, if you haven’t been yet) make sure to stop by the 20th Massachusetts monument. This strange, ugly stone is part of Boston history and a very unique way of remembering the city where the men who fought and died came from. It might even be a displaced bit of Olmsted’s greatest Park! Puddingstone along the 99 Steps in the Wilderness. 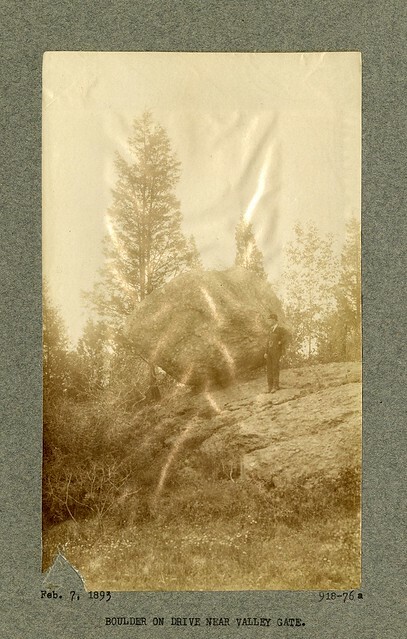 Over at the Flickr stream of The Olmsted Archives, I found this great photo of the Balance Rock from 1893. 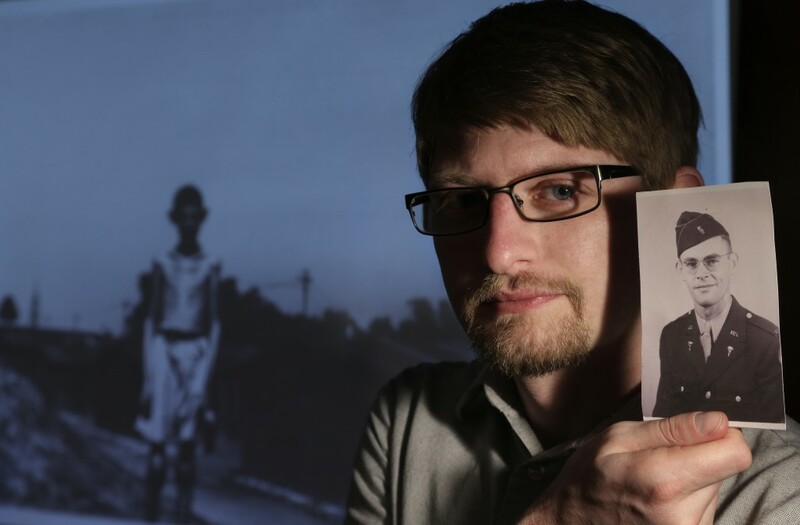 16 Photographs in the Chain NYC Film Festival!